Switch this card to Rest Mode : Choose up to 2 cards from your deck or life and add them to your hand. Then shuffle any areas you looked through. 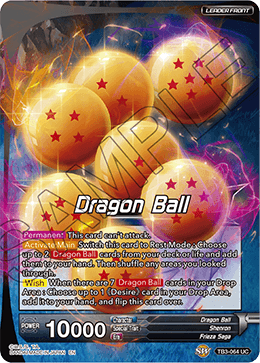 When there are 7 cards in your Drop Area : Choose up to 1 《Desire》 card in your Drop Area, add it to your hand, and flip this card over. ・Choose 1 《Desire》 card in your hand with an energy cost less than or equal to your current energy and activate its skill. ・Remove 7 cards in your Drop Area from the game. 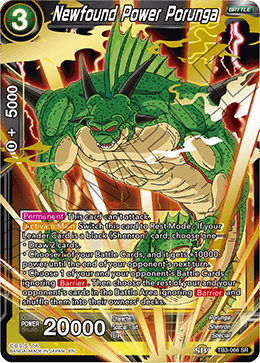 If you do, choose 1 Battle Card with an energy cost less than or equal to your current energy from your Drop Area and play it, then flip this card over at the end of the turn. 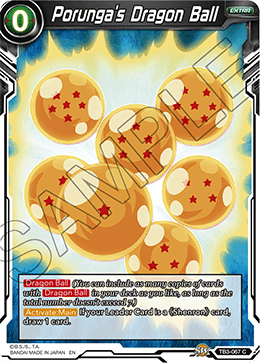 When you play this card, draw 1 card, and players can't use non-keyword skills to return Battle Cards in the Battle Area to their own hands during their turn for the duration of the game. ・Choose 1 of your Battle Cards, and it gets +10000 power until the end of your opponent's next turn. 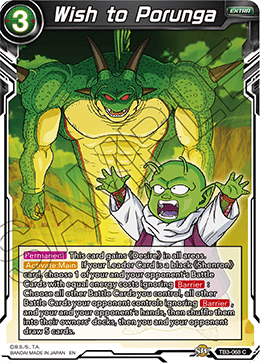 ・Choose 1 of your and your opponent's Battle Cards ignoring . 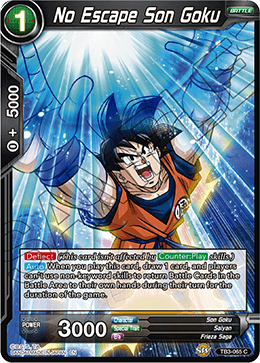 Then choose the rest of your and your opponent's cards in the Battle Area ignoring and shuffle them into their owners' decks. 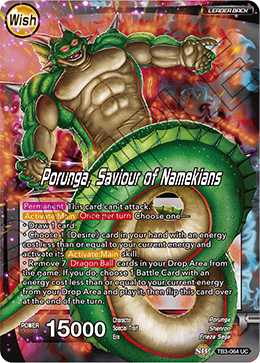 If your Leader Card is a 《Shenron》 card, draw 1 card. This card gains 《Desire》 in all areas. 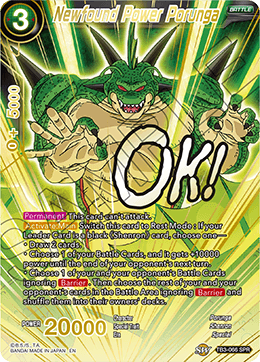 If your Leader Card is a black 《Shenron》 card, choose 1 of your and your opponent's Battle Cards with equal energy costs ignoring : Choose all other Battle Cards you control, all other Battle Cards your opponent controls ignoring , and your and your opponent's hands, then shuffle them into their owners' decks, then you and your opponent draw 5 cards.